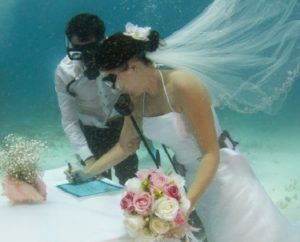 The ceremony is symbolic only, it is not a legal or religious ceremony. Available in Spanish, French, Portuguese and English. 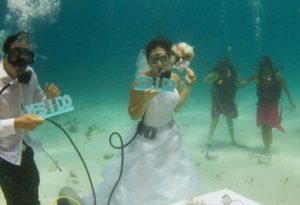 Boat decoration "JUST MARRIED UNDER WATER"
CERTIFIED DIVERS: Certified divers do not need to complete any training prior to the event but must show a valid dive cert upon check-in. 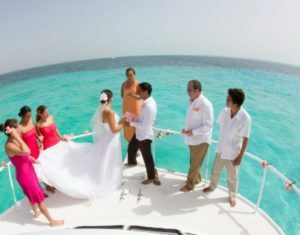 Guests may accompany the couple during the ceremony by completing the Discover Scuba course mentioned, or they can snorkel from the surface or remain on the boat. Temporary certification: Includes dive class in the pool at Aquaworld (an hour and a half) + one dive in the ocean. This class can be taken a day or two prior to the actual event. SDI (Scuba Diving International) Open Water Certification: Lifetime certification. 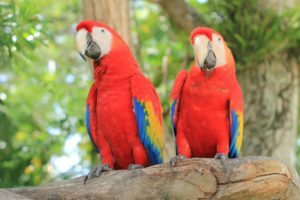 Includes – Theory training – manual or e-learning options available, pool training in Aquaworld, two days of open water diving. Day 1: Guest collects the book from Aquaworld – 1 day to read theory. Day 2: Pool training from 8.30am till 12.30pm approx. Days 3 & 4: Diving from 8am til 12.30pm. The e-learning option means that the guests can study online prior to arrival and then the same three days are required upon arrival. 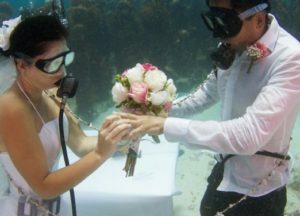 Extra cost for non-diving guests for snorkelers and per person! Bookings can be made with a 50% payment at the time of booking. 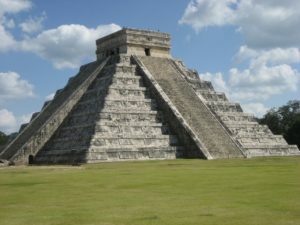 In Cancún, the summers are hot, oppressive, wet, and overcast and the winters are comfortable, muggy, and mostly clear. Based on the beach/pool score, the best times of year to visit Cancún for hot-weather activities are from late January to early May and from mid to late December. From the middle of May to the middle of August Cancún's weather is a more humid time of year and temperatures can climb to 34°C. But on the bright side, hotel prices do dip significantly. If you're planning an autumn trip (Sept-Nov), your vacation could be upset by storms – this region faces the wettest conditions and worst threat for hurricanes in the fall.